Pros: The Philips Norelco QT4000 is a decently solid beard trimmer that will do the job keeping your beard in check and it still holds enough charge to get me through the week. 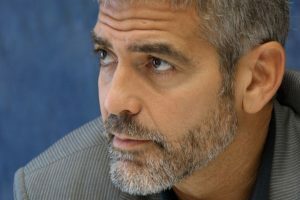 Cons: The trimmer is best option for trimming a very short beard, but you can’t use it trim your beard longer than a 1/4″. A good beard trimmer should be easy to use, have sharp blades that carefully trim hair, and utilize a convenient design that makes it perfect for any storage space in your bathroom. 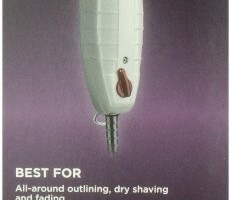 On top of that, a good beard trimmer needs to provide users with a customizable trimming experience each and every time, and necessarily take the hassle out of this (nearly) day-to-day routine. Packed with tons of features that make it an excellent choice for men, the Philips Norelco QT4000/42 BeardTrimmer 3100 is currently one of the top-rated beard trimmers on the market. But what makes it a favorite among men wishing to always look clean and neat? Read on our Philips Norelco QT4000 review to find out. Probably one of the most notable features of the Philips Norelco QT4000/42 BeardTrimmer 3100 is its built-in length adjustability. The unit is equipped with 10 settings to allow you to choose the perfect beard length, ranging from 1/32 inch (1mm) to 13/64 inch (10mm). 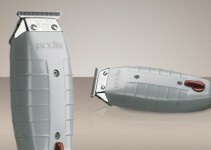 Unlike similar models, the Philips Norelco QT4000 does not require any interchangeable attachments to switch from one beard length to another, which allows for convenient use and shorter beard trimming times. The blades of the Philips Norelco QT4000 are made of fine chromium steel, with rounded tips that help prevent accidentally irritating or scratching your skin. At the same time, the titanium-coated blades are self-sharpening, which ensures you of long-lasting performance without having to replace them or the whole unit. By preventing irritation and redness, you can avoid discomfort and also save money you would otherwise spend on products that help soothe the area. Weighing at only 9.8 ounces, the Philips Norelco QT4000 is exceptionally lightweight and easy to maneuver. The design of the beard trimmer stands out through the hand-fitting shape that can easily accommodate your hand and offer a comfortable fit. Due to being quite compact in size, this Philips Norelco beard trimmer can successfully reach areas a larger model would not be able to. As a cordless unit, battery life is one of the biggest concerns users have – but not with the Norelco QT4000. This beard trimmer comes with a high-performance battery that lasts up to 45 minutes of cordless use after a 10-hour charge. Given that you will likely need up to 20 minutes at most to completely trim your beard, you can confidently utilize this Philips model more than once without recharging the battery twice. The Philips Norelco QT4000 beard trimmer comes with 10 built-in length settings that enable you to easily achieve the desired beard length without interchangeable attachments. The self-sharpen blades of this beard trimmer are made of fine chromium steel and coated with titanium, with rounded, skin-friendly tips that help prevent irritations. Weighing at 9.8 ounces, this Philips beard trimmer is lightweight and easy to maneuver. The battery of the Philips Norelco QT4000 lasts up to 45 minutes of cordless use after a 10-hour charge. 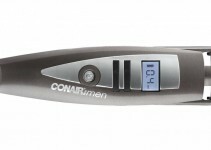 The shaver comes with a locking feature that secures the comb into place and prevents movement to ensure an even trim. 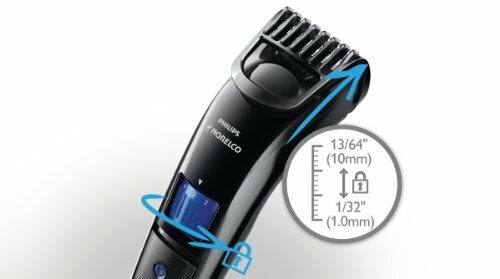 Not surprising for a beard trimmer of its level, the Philips Norelco QT4000 scores an average of 4.2 out of 5 possible stars after 932 customers have reviewed it. 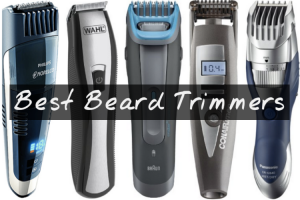 Of these, 530 have awarded the beard trimmer a full 5-star rating, 220 have given it a 4-star rating, and only 180 have offered 3-, 2-, and respectively 1-star reviews. So far, the Norelco QT4000 is one of the most promising units of its kind, having made a strong impression on customers. The Philips Norelco QT4000 is equipped with 10 different built-in length settings that allow you to achieve the desired beard length without wasting time with comb replacements. The main knob on the front of the trimmer enables you to select a length ranging from 1/32 inch (1mm) to 13/64 inch (10mm) in 1/32 inch increments. Most other shavers do not feature built-in length adjustment, which increases trimming times and makes the entire process less than desirable. One customer has stated that “the battery lasts forever.” While this is not necessarily true, we must admit that the Norelco QT4000 beard trimmer delivers 45 minutes of cordless use after a 10-hour charge, which is beyond enough for most users – even for those who want to artfully trim their beards or moustaches. A longer battery life means less time spent on charging it, plus the convenience of not having to charge it twice for a 20-minute trimming session. The Philips Norelco QT4000 has been reported to be easy to maneuver by the vast majority of users, specifically due to being very lightweight. The design of the trimmer is compact, which enables you to reach even those areas that require careful maneuvering to prevent accidentally scratching or cutting your skin. As for the cons of the Philips Norelco QT4000, there is not much to say about it. One of the most common complaints is the variation in length the trimmer causes due to the adjustable guide not being very precise. Although Philips claims that the unit will securely lock the comb to prevent further movement, a few customers have reported it to oscillate, hence making the beard-trimming process not so hassle-free. Furthermore, the design of the shaver seems to be rather poor if attempting to trim longer beards, as it kind of blocks lengthier hair and pushes them away from the blade. This can be a major struggle if you aim for a longer beard. Despite a couple of shortcomings, the Philips Norelco QT4000 remains one of the most outstanding beard trimmers on the market. 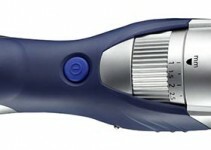 The vast majority of customers were extremely satisfied with the performance of the shaver, and some have reported it to last for several years without losing its trimming capacity. Priced conveniently at just $19.95, this Philips beard trimmer is easily a bargain that will certainly become your favorite.